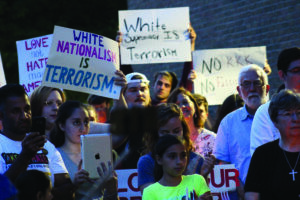 CHARLOTTESVILLE/DEARBORN — Dearborn residents assembled in healing and solidarity with Charlottesville, Virginia on August 13 and 16, against White supremacy — reemphasizing the city’s cohesive nature in visible diversity that trumps hate. The first peaceful vigil, in which at least 100 demonstrators gathered on Sunday, was promptly organized in only 12 hours by a few residents on social media. As for the Wednesday demonstration of “healing and uplifting”, University of Michigan-Dearborn student activists took charge, garnering nearly 200 attendees. 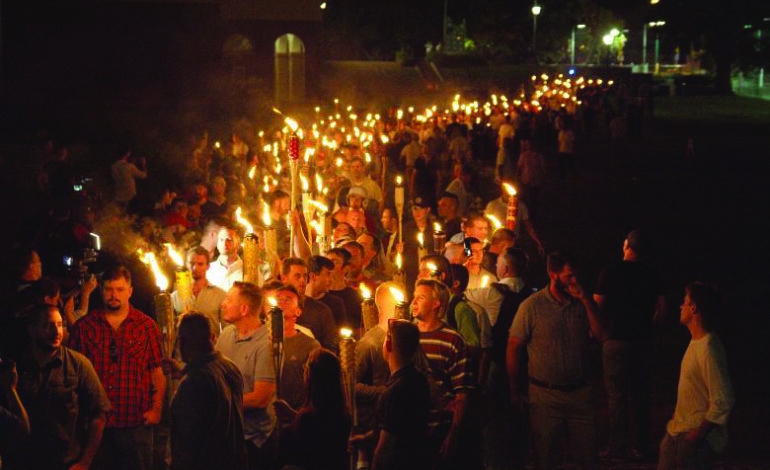 Protesters silently held candles and solidarity posters with statements such as “White Supremacy is Terrorism”, “Remember Heather Heyer”, “No KKK, No Fascist U.S.A”, “Love Your Brothers And Sisters” and more that elevated their voices symbolically in their stance against hatred. Keynote speakers included U.S. Rep. Debbie Dingell (D-Dearborn), her husband, former U.S. Rep. John Dingell, State Rep. Abdullah Hammoud (D-Dearborn), Mayor Jack O’Reilly, Imam Mohammad Elahi, head of the Islamic House of Wisdom in Dearborn Heights, pastors and City Council candidates. The horrific clashes that took place August 12 had started with a White supremacist “Unite the Right” rally against the planned removal of Confederate General Robert E. Lee’s statue from a public park in Virginia. The fights broke out in downtown Charlottesville in the morning, when hundreds wearing White nationalist symbols and carrying lit Tiki torches, firearms, shields and Confederate flags were met by counter-protesters. According to Reuters, the protest had also resulted in one arrest the evening prior. The state’s democratic governor, Terry McAuliffe, held alt-right protesters responsible for instigating these clashes and declared a state of emergency, while the city confirmed the unlawfulness of the “Unite the Right” rally. The protest was then canceled before its scheduled start time, as clashes continued throughout the city. 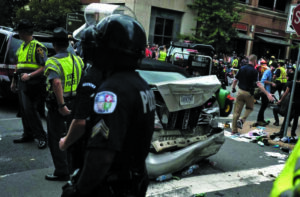 One of the White supremacists violently plowed a car into a group of counter-demonstrators, killing Heather Heyer, a 32-year-old legal assistant and civil rights activist, and injuring at least 19 others. An additional 14 people were allegedly injured in different incidents. Also, two Virginia policemen died in a helicopter crash nearby as they monitored the situation. Charlottesville Mayor Mike Signer called the vehicle attack a “terrorist attack with a car used as a weapon” in an interview with NBC’s “Meet the Press” on Sunday. The attacker, James Alex Fields Jr. was charged with second-degree murder and other counts. President Trump drew criticism when he said “many sides” were involved, asserting that counter-protesters should also be blamed instead of denouncing the White supremacist rally that led to murders and injuries. Some Republican leaders condemned his statements, while White supremacists like former Ku Klux Klan leader David Duke commended him. “You had a group on one side that was bad,” Trump said in a news conference on Tuesday. “And you had a group on the other side that was also very violent. And nobody wants to say that. But I’ll say it right now. “I think there is blame on both sides and I have no doubt about it,” Trump said, adding that there were “very fine people” in both rallies. 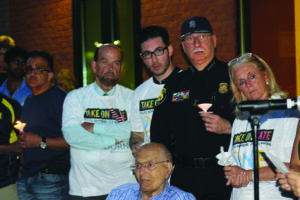 Local resident Mary Kay Kubicek organized the Aug. 13 vigil at the Dearborn Veterans Park and War Memorial with the help of others, who were just as frustrated as she was. Rep. Dingell was one of the attendees. “We have to remember united we succeed and divided we fall,” she shouted. “People need to use this moment to take time to get to know each other, to listen to each other, to understand that each of us has different experiences and come from different backgrounds,” Dingell added, after quoting Martin Luther King, Jr.
She also said the negative rhetoric needs to end. “White supremacy, racism, these are sins that keep us from being the kind of community and kind of nation that we need to be,” said Pastor Fran Hayes of Littlefield Presbyterian Church. Mayor O’Reilly said there’s no place for violence in America. Even though the Sunday demonstration seemed to lack youth and had more middle aged and elderly adults in attendance, which some goers felt “ambivalent” about, they still told The AANews that the turnout was great for only a 12-hour notice. Nevertheless, young blood at the University of Michigan-Dearborn did not sleep on the matter, but only needed time to process the tragic events. Student Government Vice President Sara Alqaragholy, 20, told The AANews that she became numb the day after the protests and deaths happened in Virginia. Alqaragholy and her friends, Micho Assi, a former president of the Pre-Law Association, PRIDE Treasurer Jordan Yunker and incoming Freshman Nour Ali, organized the peaceful demonstration and created a Facebook event, inviting as many people as they knew. However, they didn’t expect the tremendous turnout they had. We had a group of extremists, White nationalists who now feel emboldened because of a leadership we have in Washington D.C., who is unable to condemn by name… He failed us as a leader of a nation that’s supposed to respect all individuals. 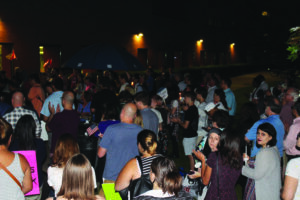 Rep. Dingell and John Dingell were among those in attendance at the Aug. 16 vigil, held on the U of M-Dearborn campus. Both Mayor O’Reilly and Pastor Hayes also spoke at the vigil. Elahi condemned Trump’s statements at the rally, saying that this is a nation that needs to be led with respect and unity. Rep. Hammoud, who did not attend the first vigil due to being out of town, said he wished to be in Dearborn as he watched what was happening in Charlottesville. Hammoud said Trump failed American citizens. U of M-Dearborn Chancellor Daniel Little and activist Amer Zahr also spoke at the event. In a final note, Rep. Dingell thanked the younger generation and expressed her pride.